After shooting the border guards, a day later, they opened fire on a civilian vehicle. Two incidents took place near the Armyansk checkpoint on 6-8 August, which resulted in Russian troops using their weapons. In both cases, they were in a state of alcoholic intoxication. According to LB.ua sources, in the early hours of 7 August, Russian troops on service near the Armyansk checkpoint fired on the border guards who approached them by the water in boats. The border guards opened fire in response. As a result of the shoot-out, one person was killed (border guard), four (one soldier and three border guards) were injured. A day later, in the early hours of 8 August, Russian soldiers again opened fire at the Armyansk checkpoint in the Crimea. This time they fired on a civilian car heading for Kherson Region. On approaches to the Armyansk checkpoint, Russian servicemen (five people) stopped a Skoda Fabia driven by a 23-year-old resident of the village of Suvorove, Hafiz Muhamadov. There was also a 20-year-old girl in the car. They were going to visit their relatives in Khrestivka, Chaplynka District (Kherson Region). According to the sources, the drunk servicemen demanded that the young people provide additional documents, besides passports. The driver asked them to clarify who they were and refused to provide the documents. A brawl ensued, and the servicemen opened fire on the car. When Muhamadov and the girl ran out of the car, the servicemen shot at them. The girl was lightly wounded but six bullets hit Muhamadov. According to the sources, the servicemen realised what they had done and run away. Soon three of them were detained. Hafiz Muhammad is alive, he came out of the coma yesterday. At the moment he is in Krasne in a guarded hospital. Local authorities told the elders, who were trying to find out what happened, that Hafiz was carrying explosives, and therefore was hurt. The local police dispersed a public gathering (qurultay). 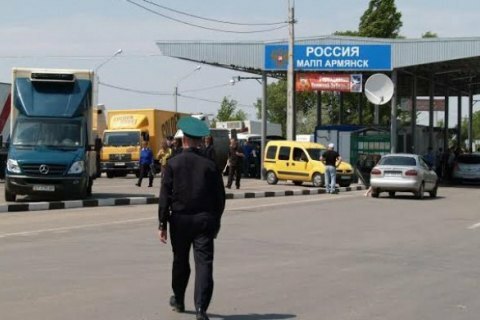 As reported earlier, on 7 August, Russia suspended the work of all checkpoints in Crimea because of the alleged shoot-out, which was heard on Ukraine's administrative border with Crimea. There were no Russian official reports on the incident. Three days later, the FSB accused the Ukrainian Defence Ministry's Main Intelligence Directorate of plotting terrorist attacks in Crimea, as later did Russian President Vladimir Putin. Also, the FSB announced the capture of an alleged Ukrainian subversive group. However, LB.ua reported that, according to search warrants posted across the peninsula, Russian servicemen were at large and wanted. Ukrainian Foreign Ministry condemns "Kremlin-manufactured provocation"
President: Russia's accusing Ukraine of terrorism in Crimea "cynical, absurd"